I now hope that the scepticism of the relatives of MH370 passengers will be taken seriously ... relatives who are of the belief that the search in the Southern Indian Ocean off the coast of Australia has been a detraction from actual happenings that may have taken place on the morning of March 8, 2014 in another area of the same ocean. Could it be that the pilot of MH370 was on a mission to destroy after rendering his passengers unconscious after ascending to a maximum altitude for over 20 minutes? Could it be that the pilot continued West towards the Maldives Islands after reaching the Indian Ocean? Despite an official denial ... could it be that a report will be deemed valid ... a report which quotes residents of Kuda Huvadhoo in the Maldives who observed a low flying plane headed South towards the Island of Diego Garcia ... a top secret military base where Islamic terrorists have been detained for interrogation? Quoting an unnamed official with the investigation team, the newspaper also appears to suggest the possibility that the plane “ landed” somewhere else entirely. “We may have to regroup soon to look into this possibility if no positive results come back in the next few days ... but at the same time, the search mission in the Indian Ocean must go on,” the source was quoted as saying. “The thought of it landing somewhere else is not impossible, as we have not found a single debris that could be linked to MH370. Experts, relatives ask: Where's the proof that MH370 fell into ocean? An executive from Inmarsat, the British company that carried out the satellite analysis, said the route into the southern Indian Ocean was the "best fit" with the pings received from the plane. "The most likely route is the south, and the most likely ending in roughly the area where they're looking now," Chris McLaughlin, a senior vice president at the company, told CNN's Wolf Blitzer. "But, of course, nothing is final," he said. "We're not earth observation satellites, we're data satellites. So it will require a lot of different skills, a lot of different people, not least the naked eye, to finally confirm what happened to 370." McLaughlin said the mathematics-based process used by Inmarsat and Britain's Air Accidents Investigation Branch was "groundbreaking." The new calculations underwent a peer review process with space agency experts and contributions by Boeing, he said. Arthur Rosenberg, an aviation attorney, said he was troubled by the different language used by the satellite company and Malaysian officials. "On the one hand, you have the executive from Inmarsat saying 'most likely' and somehow that got booted up to 'beyond reasonable doubt.' I don't agree with that," Rosenberg said. "I am not convinced that they are certain where this airplane is," he said. "I think they have fine-tuned it to a general area, but to say beyond a reasonable doubt this plane went down where they are saying is a stretch." The United States today has refuted rumours that missing Malaysia Airlines flight MH370 could have landed at its military base on the remote island of Diego Garcia, the Daily Mirror reported. The English daily quoted a spokesman for the US embassy in Kuala Lumpur as saying that there was no truth to this speculation. "There is no indication that flight MH370 flew anywhere near the Maldives or Diego Garcia," Daily Mirror quoted the spokesman who told The Star in an email. "Malaysia Airlines flight MH370 did not land in Diego Garcia," he said. Up to 10 military aircraft and 12 ships will assist in today's search for missing Malaysia Airlines flight MH370. Today the Australian Maritime Safety Authority has planned a visual search area totaling approximately 37,948 square kilometres. The centre of the search area lies approximately 855 kilometres north west of Perth. Bluefin-21 AUV is currently completing mission ten in the underwater search area. Bluefin-21 has now completed more than 80 per cent of the focused underwater search area. No contacts of interest have been found to date. The weather forecast for today is for isolated showers increasing to heavy rain, widespread low cloud, with south easterly winds, sea swells up to 2.5 metres and visibility of one kilometere. Prevailing weather conditions may affect today's air search. Could it be that the pilot of MH370 was on A MISSION TO DESTROY after rendering the passengers/crew unconscious following an ascension to a maximum altitude for over 20 minutes? Despite an official denial ... could it be that a report will ultimately be deemed valid ... a report which quotes residents of Kuda Huvadhoo in the Maldives who observed a low flying plane headed South towards the Island of Diego Garcia ... a top secret military base where Islamic terrorists have been detained for interrogation? Could it be that Diego Garcia "powers that be" recognized that a terrorist attack targeting the top secret US base was imminent and ... in a defensive response MH370 was taken down? Could it be that a cover up began six weeks ago when it was realized that a commercial airliner with 239 passengers and crew had been shot down? Could Homeland Security imply that the plan was that world attention would not become focused on that remote US military base in the middle of the Indian Ocean? It is still unknown why flight MH370 suddenly turned off its communications, changed its course dramatically and flew low. Yet, it is extremely unlikely that America's military intelligence eyes would have really missed the plane. 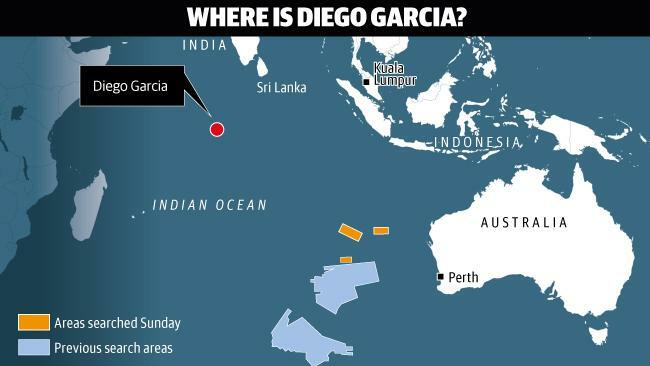 This is especially because the new path of the plane appeared to be possibly TARGETING Diego Garcia as the destination - the place which is kept top secret. When it is considered that an executive from Inmarsat is unable to confirm with certainty the direction taken by MH370 once it reached the Indian Ocean (above) and ... when it is considered that the Australian Air Force P-3 Orion cannot confirm with certainty that the detected four pings originated from the missing Malaysian airliner ... why has the search for MH370 not been more far reaching? Australian search officials had said they picked up "possible signals" from a man-made source more than a week ago and those signals have now stopped. The Australian air force P-3 Orion, which has been dropping sonar buoys into the water near where the sounds were picked up four times, have not verified the pings as coming from Malaysia Airlines Flight 370. Planned air search activities have been suspended for today due to poor weather conditions in the search area. Three aircraft had already departed for today's search area prior to the suspension taking effect. They have been recalled. Current weather conditions are resulting in heavy seas and poor visibility and are making air search activities ineffective and potentially hazardous. The 12 ships involved in today's search will continue with their planned activities. (CNN) -- Australian officials say an "object of interest" in the search for the missing Malaysia Airlines plane has been found, but Malaysia authorities said it was too early to tell if it is a real lead. "It's sufficiently interesting for us to take a look at the photographs," he said. "We take all leads seriously." At a news conference Wednesday, Malaysia's acting transport minister Hishammuddin Hussein said his country has not received any photos from Australia, and that so far, all of the objects found in the search have not been related to the missing plane. "The more we look at it, the less excited we get," Dolan said. When asked about the shape and scale of the object, the source described it as "kind of rectangular," but torn and misshapen. For the sake of the families of MH370 passengers I hope this find if related provides them with at the very least a measure of closure. Each day since this plane went missing the not knowing must be a h--- on earth. I cannot comprehend why the pilot flew for over six hours attempting to avoid detection only to crash the plane into the Southern Indian Ocean. In my opinion it makes no sense when he could have done the deed with little preparation in the South China Sea somewhere on the path between Malaysia and Beijing? It makes sense to me that the pilot was on a mission. He had a purpose when he turned that plane around and headed for the Indian Ocean. I could be wrong. I do believe that the truth ... whatever it is ... will be revealed. Answers are yet to be forthcoming in regards to this find that washed up on a beach in the Maldives. Why? The comments at this site are interesting. Debris from missing flight MH370 washed up on a beach in the Maldives? While the whole world is eagerly watching the news for suspected debris from the missing Malaysian airline flight MH370, Maldives newspaper Haveeru which earlier reported a possible sighting of the plane flying low over an island of Maldives have again reported that an object suspected to be a fire suppression bottle of an aircraft has washed up on the beach of one of the islands in the Maldives. This discovery of this possible debris, from missing Malaysian airline flight MH370 comes a week after several residents from Kuda Huvadho, another island in the Maldives, reported sightings of a very low flying jet over their island on the day the flight went missing. 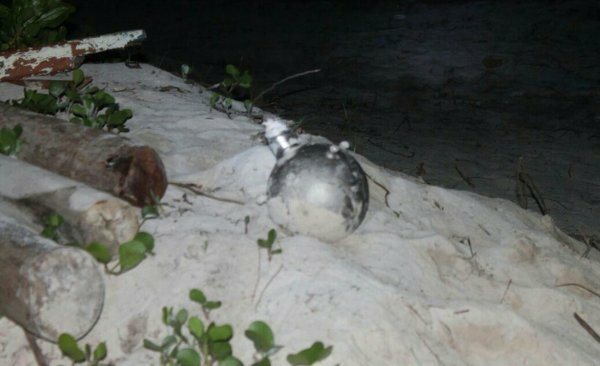 However both the Maldives National Defence force and Malaysian authorities have denied the sightings and Maldives National Defence force have not revealed any details of this washed up “fire suppression bottle”. Malaysia has yet to decide whether to publicly disclose an initial report submitted to international aviation authorities on the disappearance of Malaysia Airlines Flight 370, the country’s director-general of civil aviation said on Wednesday. The Southeast Asian country has filed the preliminary report as required by the International Civil Aviation Organization, Azharuddin Abdul Rahman told a news conference. He didn’t specify when it was filed or offer any details of the contents. Reports to the ICAO, a U.N. body based in Montreal, are required from the country conducting an investigation within 30 days of an accident and would include the sequence of events and other technical aspects. The Boeing 777-200 disappeared March 8 with 239 people aboard during a flight from Kuala Lumpur to Beijing, and the search is focused on a portion of the Indian Ocean based on analysis of satellite data and possible pings from the flight recorders. No confirmed wreckage has been found. It has been 47 days since MH370 went missing. As stated by the Joint Agency Coordinating Centre in Perth earlier today, up to 10 military aircraft and 12 ships will assist in today’s search for missing Malaysia Airlines flight MH370. I will now update you on the International Investigation Team. Cabinet has deliberated and approved the appointment of an International Investigation Team to investigate the MH370 incident. The Ministry of Transport (MOT) has been tasked to draft the Terms of Reference for the investigation team. As I’ve announced previously, the sub committee, led by Aziz Kaprawi, Deputy Minister of Transport has been assigned the task to coordinate the formation of the International Investigation Team. On that note, Malaysia as the Contracting State and a Council Member of the International Civil Aviation Organization (ICAO) will observe and comply with the standards and recommended practices of ICAO set mainly to look into the safety of international civil aviation. The main purpose of the International Investigation Team is to evaluate, investigate and determine the actual cause of the incident so similar incidents could be avoided in the future. I would also like to note that the investigation will not include criminal aspects which are under the purview of the Royal Malaysian Police. This investigation will be carried out in accordance with the Civil Aviation Regulation 1966 and the standards set under Annex 13 – Aircraft Accident and Incident Investigation, the Chicago Convention, which requires each party to investigate air accidents independently with full powers in their respective countries. The Aviation Accident Investigation Bereau (BSKU – Biro Siasatan Kemalangan Udara) which was established since December 2011 under the Ministry of Transport will act as the Secretariat for this investigation team. psychology, pathology and survival factors. We are also discussing to appoint experts from other ASEAN countries in accordance with the ASEAN MoU on Cooperation Relating to Aircraft Accident and Incident Investigation that was signed in 2008. We are in the process of identifying the members and the accreditated representatives and will be recruiting the members for the team in accordance with international standards. We will announce the name of the members next week. Indeed, it is imperative for the government to form an independent team of investigators which is not only competent and transparent but also highly credible. As I’ve consistently said since the beginning, we have nothing to hide. Western Australia Police have attended a report of material washed ashore 10 kilometres east of Augusta and have secured the material. The Australian Transport Safety Bureau (ATSB) is examining the photographs of the material to determine whether further physical analysis is required and if there is any relevance to the search of missing flight MH370. The ATSB has also provided the photographs to the Malaysian investigation team. Up to 11 military aircraft and 11 ships are planned to assist in today's search for missing Malaysia Airlines flight MH370. Today the Australian Maritime Safety Authority has planned a visual search area totaling approximately 49,567 square kilometres. The centre of the search area lies approximately 1584 kilometres north west of Perth. Prior to the commencement of today's air search operations, an assessment of current weather conditions will be made as ex-Tropical Cyclone Jack moves south. The weather forecast for today is for heavy rain and low cloud, with south easterly winds up to 35 knots, sea swells of three to four metres and visibility of one kilometre. Bluefin-21 AUV is currently completing mission 12 in the underwater search area. Bluefin-21 has now completed more than 90 per cent of the focused underwater search area. No contacts of interest have been found to date. LESS than a tenth of the underwater search area for the missing Malaysia Airlines flight remains to be scoured, while the possibility of a fresh lead has been ruled out. It emerged late on Wednesday that debris had washed up on a beach 10 kilometres east of Augusta, about 320km south of Perth and near Australia's most southwestern tip. A member of the public stumbled across the items, which were handed to Busselton police, who sent photos to the Australian Transport Safety Bureau (ATSB) for examination. ATSB chief commissioner Martin Dolan immediately played down the find, saying the objects were "sufficiently interesting" enough to require scrutiny, but adding: "The more we look at it, the less excited we get." Mr Dolan told CNN the debris appeared to be sheet metal with rivets. And by Thursday morning, the ATSB had concluded there was nothing to indicate the items were wreckage from the lost Boeing 777. "We want to pursue every possible lead that will help us find MH370, but sadly this is one that isn't going to help that search," Mr Dolan told ABC Radio in Perth. The Joint Agency Co-ordination Centre (JACC), led by former defence chief Angus Houston, later confirmed the ATSB was satisfied the debris was not a fresh lead. (CNN) -- Facing anger from families of Flight 370 passengers, Malaysia's Prime Minister said Thursday his government will release its preliminary report on the plane's disappearance. In a TV exclusive, Najib Razak told CNN the report will be available to the public next week. "I have directed an internal investigation team of experts to look at the report, and there is a likelihood that next week we could release the report," Najib said. Later in the interview with CNN aviation correspondent Richard Quest, he gave a more definitive statement, saying the report will be released next week. Najib also discussed why he is not yet officially declaring the flight -- and the 239 people on board -- lost. A committee representing some of the Chinese families have posted 26 questions on the Chinese social media site Weibo. Usually, such reports to the ICAO are public, Quest says. "In most cases, the report is published because it's not a controversial document," he said. "It's a statement of facts -- what happened. And if there are any controversial or difficult facts, they can be redacted." Malaysia has insisted it has nothing to hide and is working to find answers. Malaysia has not been known as a model of transparency. The same political party has ruled the country for the past 50 years, and the media is not completely free. For its part, the Malaysian Cabinet has agreed to have an international team investigate the disappearance of Flight 370, the country's acting transportation minister said. Page created in 5.653 seconds with 19 queries.